Corralco, Chile – Imagine a land that stretches 2,670 miles north to south, but only 217 miles at its widest point from west to east—a magical land where you can reach both the vast mountains and epic surf within just a few hours. That’s Chile, where the Andes offer the goods for top-condition preseason training camps for U.S. Ski Team alpine athletes. Located nearly eight hours south of the Chilean capital of Santiago is a sparkling country, a place where you ski on a volcano, encounter breath-stealing views and feel the energy of the earth. And standing in a sea of sacred, pre-historic Araucaria araucana trees (a.k.a. “Monkey Puzzle Trees”) with the Lonquimay Volcano staring at you, you’ve found yourself at the heavenly Corralco Ski Resort in Southern Chile’s untamed wilderness located in the Malalcahuello National Reserve. It was this special land that U.S. Head Coach Sasha Rearick visited on one of his storied ski resort scouting missions in 2014 when he met a man named Jimmy Ackerson. Ackerson hails from “a soon-to-be emerging alpine nation known as Connecticut” where he grew up skiing at Sugarbush Resort in Vermont. Conveniently, the ski school director at Sugarbush was also the ski school director at famed Portillo, Chile. That meant that Ackerson had the chance to spend his summer vacations during university working in Portillo, noting that he “decided it was much more interesting to work in skiing than in criminal justice administration.” So he started his career in Portillo, then moved to Valle Nevado as their Marketing and Sales Manager before being promoted General Manager, and eventually landed in Corralco as their General Manager in 2014. An average winter is around 230 inches of snowfall, but this season they’ll be getting around 280 inches. With southern exposure on all of the slopes and a variety of pitches, when the weather is good it means the training is pretty remarkable. So when the winter in the central region of Chile was bad in 2014, Rearick rocked up to Corralco along with a host of other nations including Germany, France, Switzerland and Italy for some pretty spectacular speed training. When this summer came around, the alpine team was heading to Portillo for pre-Olympic season speed training, but low snowfall meant Portillo’s base was not sufficient. The U.S. 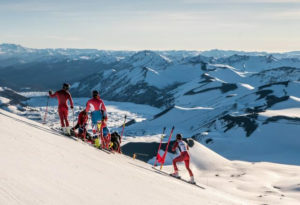 Ski Team coaches worked to find a solution that would make sense for everyone, relocating teams to four different venues, including Corralco for the men’s and women’s speed team. Two successful prep period training camps with 90-second, real-deal downhill training on a buff, steep surface, the U.S. Ski Team athletes left Corralco with smiles on their faces, lots of super-G, downhill and giant slalom laps under their belts and ready to take on the Audi FIS Ski World Cup with confidence. Along with that, athletes left inspired by yet another insanely beautiful and unique destination. Goodbye, Southern Hemisphere. Hello, Northern Hemisphere. What’s next?! The U.S. Ski Team is ready to kick off the big Olympic year with training camps in Austria before the World Cup kickoff in Soelden, Austria and onward to the U.S. Ski Team Speed Center at Copper Mountain, Colorado in November. Corralco has also played host to racers from Burke Mountain Academy, the Winter Sports School in Park City and with a deep base and six feet of snow falling this month alone (no joke), will offer world-class training opportunities to clubs through October. The central region of Chile is all high-altitude skiing, while in Corralco, they get great snow from 1,500 meters up to 2,500 meters.